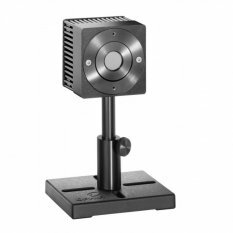 The 30(150)A-HE-17 is thermal power/energy laser measurement sensor with high damage threshold for pulsed lasers. It has a 17mm aperture and can measure from 50mW to 30W continuously and to 150W intermittently. It can measure energy from 60mJ to 200J. Its HE absorber has a damage threshold of up to 5J/cm² and with some gaps covers the spectral range from 0.19 to 2.94µm. The sensor comes with a standard 1.5 meter cable for connecting to a meter or PC interface.